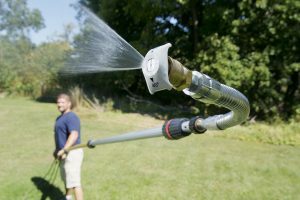 What is the difference between using hot water or cold water when pressure washing? Hot water pressure washing or hot power washing, as it is sometimes called, is a great way to degrease areas to be painted. Hot washing also removes gum and stains from concrete walkways very efficiently. However, while cold washing with a degreaser will get some of the oil off the surface, a hot wash will do much better. Give us a call to see what we can do for you.